Stenberg Coalition is an unusual outcross tool proving himself in northwestern Montana's tough environment. 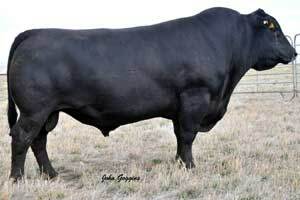 Here’s a 5 frame bull that is just packed with red meat and volume that comes off the cows in super condition. His is out of a powerful cow that is an extremely efficient, highly productive female with 4 calves ratioing 9 for birth weight, 11 for weaning weight, and 112 for yearling weight. Coalition’s calves mirror that performance. For three years, Coalition calves have outperformed their herd mates out of nationally ranked Angus and Charolais sires. 6 star efficiency, 6 star tenderness. This bull is made for a grass program.